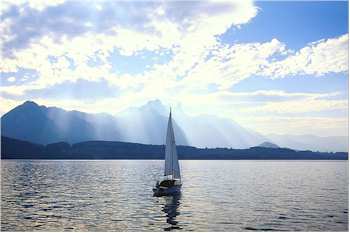 ABOVE: A boat on Lake Thun sails toward the Stockhorn. The Bernese Oberland's funiculars, cable cars, and mountain railways are often packed with tourists during the high season. When you've had your fill of the crowds on the Jungfraujoch Railway or the Schilthorn, take time to visit some of the region's less known (and less expensive) alternatives--such as the Stockhornbahn, a two-stage aerial cable car that takes 20 minutes to reach an elevation of 2,190 meters (7183 feet) above the Simmental and Lake Thun. The Stockhorn is famous for its wildflowers and other botanical offerings. From the intermediate Chrindi station of the Stockhornbahn, you can follow the Stockhorn Nature Path (3 hrs. 30 min.) or hike downhill through meadows and forests to the village of D�rstetten (4 hr. 45 min.) Another option is the alpine botanical trail or "flower path" to the summit, where you can return to the Stockhornbahn's valley station at Erlenbach im Simmental by cable car. 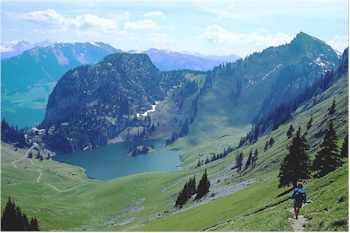 The Stockhorn has two pretty mountain lakes on its slopes: the Hinterstockensee and the Oberstockense. You can catch up to six trout per day by purchasing an angler's Tageskarte (day card) in the Stockhornbahn's valley station. In summer, the Stockhorn offers bungee jumping, hang gliding, paragliding, and rock climbing for intrepid travelers. In winter, you can enjoy snowshoeing, an "igloo village," and activities on a frozen lake. Hiking on marked trails is available year-round. ABOVE: Hiking on the Stockhorn. In summer, the Stockhornbahn runs from mid-May through early November. Cable cars leave the valley station every 30 minutes from morning until late afternoon, or more often at periods of high demand. The cable car takes nine minutes to reach Chrindi, where a second cable car leaves six minutes later for the five-minute ride to the summit. For current timetables and ticket prices, see the official Web site (link below). At the Oberstockenalp, which is accessible on foot on the hiking trail between the Chrindi and summit stations, 30 beds are available in a mountain chalet during the summer season. For details in German, visit www.oberstockenalp.ch. By car. You can reach Erlenbach i. S. from Gwatt or Spiez and park (for a fee) by the Stockhornbahn station. See the Stockhornbahn's how to get here page for transportation details. The cable railway's official site has information on schedules, fares, restaurants, hiking possibilities, etc. in German and English.